Thanks so much to Louise from Fountain Cosmetics who sent me this beautiful hair mask! I have used it once a week since it arrived and I have seen a major difference in how soft, clean and moisturised my hair feels. This beautiful little pot contains extracts of oat beta-glucan, macadamia, argan and shea butter wich all help in the process of repairing and revitalising hair. This product is great for those of us with dry, damaged or colour treated hair as it will make your hair softer and easier to manage.This amazing mask also contains keratin wich is the best ingredient out there when it comes to nourishing your luscious locks. 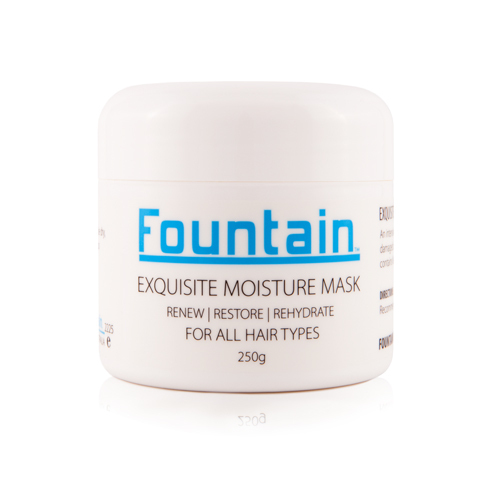 The Exquisite Moisture Mask is suitable for all hair types and I had no irritation from it even though I have very sensitive skin. It was nice and easy to use, just apply it from roots to tips and let is sit for 3-5 minutes then rinse and dry as normal! Using this once a week will be plenty enough in my opinion but for recently colour treated and dry or damaged hair twice a week is the way to go. Be sure to leave a comment letting me know what you thought or to contact me on twitter or Instagram!